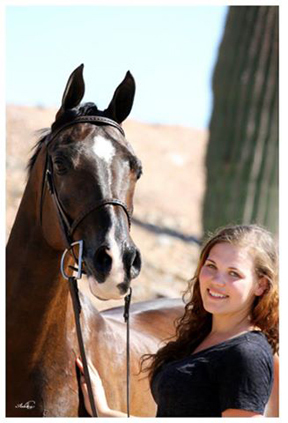 Katie Johnson of Surrey, BC was honoured as the 2013 Arabian Horse Association (AHA) Youth of the Year during a special awards presentation at the annual AHA Member Convention in Lexington, KY, USA on Nov. 23. Johnson is the first-ever Canadian to win this prestigious award, which is given annually to an AHA youth member who displays competitive excellence, academic achievement, and a commitment to volunteerism both in and outside of the equestrian industry. Together with her 11-year-old part Arabian gelding, Solider Boi HMG, Johnson has won numerous titles at the local, regional, and national level. She has also held the position of Youth Director for Region 17 (Western Canada) for the past three years, and has raised almost $20,000 in support of AHA youth activities. Outside of her equestrian pursuits, Johnson graduated from Tamanawis High School with honours in 2013 and has been active in both 4-H Canada and the Girl Guides of Canada. As the AHA Youth of the Year winner, Johnson received $1000 in scholarship funding and will be featured on the cover of the spring issue of Modern Arabian Magazine. For more information on the AHA, visit www.arabianhorses.org.